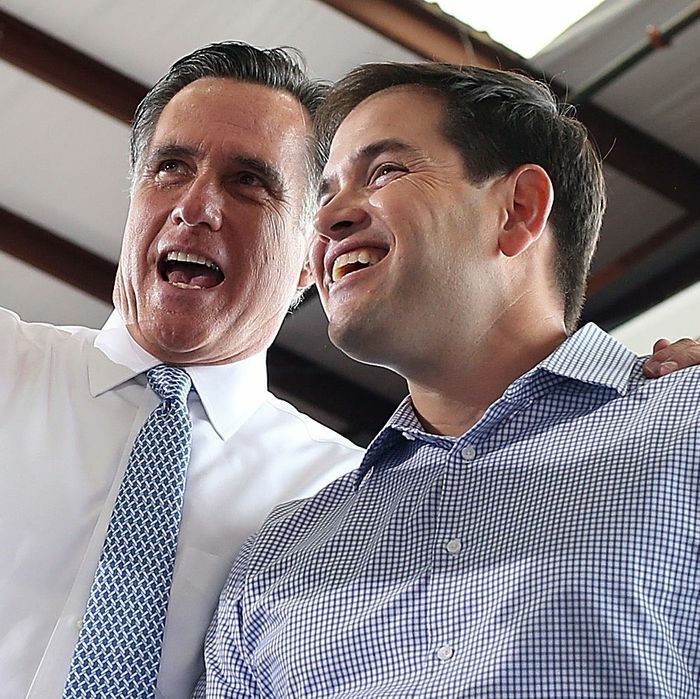 Mitt Romney and Marco Rubio, sometime in the late, late, late 20th century, like 2012. Stating that his agenda is more detailed than anybody else’s, a debatable claim given his currently quite sparse platform, would not refute the charge that it is a cookie-cutter agenda. Rubio’s promises to deregulate Wall Street and the fossil-fuel industry, enact a massively regressive tax cut, and repeal Obamacare, are standard issue — one might even say cookie-cutter — Republican proposals. Well, we’re in a different era. For example, my policies are about taking free enterprise and limited government, but applying them to the unique challenges of the 21st century. So you’ll hear me spend a tremendous amount of time talking about higher-education reform. Our higher-education model is outdated. And I proposed concrete bipartisan ideas about how to fix some of those things. We’re in an era now of increased global competition where America no longer can put in place policies because we think ideologically it’s a good or bad idea. The fundamental question is does it make us competitive again. And on many of those issues, I’ve offered solutions and ideas that no Republican’s ever talked about before because they were not part of the 20th century debate. Okay, so asked if he disagrees with Bush or Romney on anything at all, Rubio does not directly offer any examples. Instead, he says he will “spend a tremendous amount of time talking about higher-education reform.” This is an interesting and perhaps accidentally blunt description of his political strategy. (Obviously Rubio wants to spend a lot of time talking about higher-education reform, and less time talking about less popular things he plans to do in office.) But it’s not true that other Republicans never talked about reforming higher education. Romney talked about it a lot. What’s stranger is Rubio’s claim that his issues — actually, issue, singular, is completely novel to anything considered by Bush or Romney because “they were not part of the 20th century debate.” The gambit here is to wall off any association between Rubio and previous Republican failures by drawing a line at the century mark, after which all intellectual continuities stop. The trouble with this little trick is that the Bush administration took place from 2001 to 2009. Romney ran for president in 2008 and 2012. All these things took place during the 21st century. Obviously, locating Bush and Romney in the wrong century is a silly gaffe rather than Rubio actually not knowing what century the Bush administration took place in. But it’s not just a silly gaffe. Rubio is a George W. Bush Republican who needs to come up with nonsense concepts to deny the fact that he’s a George W. Bush Republican, like pretending his ideas don’t relate to Bush’s because they’re from different centuries. He can’t name a single actual disagreement with Bush or Romney because there aren’t any.